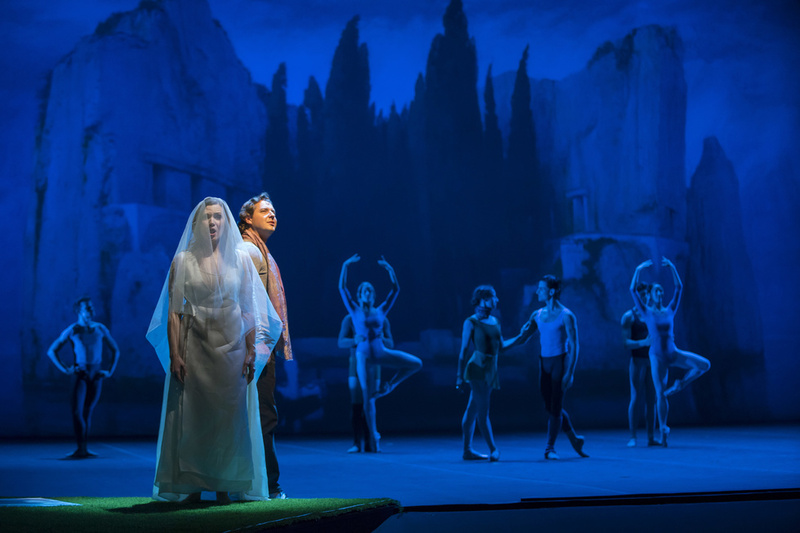 Orphée et Eurydice was a night of many firsts: the first ever collaboration between Joffrey and the Lyric, and the first time Neumeier created a new work on the company. "Asking John Neumeier to create a work in Chicago was very important and extremely special," says Joffrey artistic director Ashley Wheater. "There isn't a company in the world that doesn't want one of his ballets." Joffrey Ballet's Victoria Jaiani and Temur Suluashvili in "Orphée et Eurydice. "Courtesy Great Performances. A Milwaukee native, Neumeier trained in Chicago as a young dancer, and once performed at the Lyric Opera. "It's a wonderful homecoming for a great American choreographer to come back to his roots in the Midwest and produce this sublimely beautiful opera," says Wheater. Orphée et Eurydice is based on the Greek myth of Orpheus, who descends into the underworld to bring his beloved wife Eurydice back from the dead. It's not Neumeier's first encounter with the epic tale; in 2009 he created Orpheus for the Hamburg Ballet, where he's served as artistic director since 1973. Here, Neumeier tackles Christoph Willibald Gluck's lesser-known "French score" (revised for the Paris Opéra in 1774), and plays triple duty as director, choreographer and designer, envisioning striking sets, lights and costumes. Gluck's aim was to reform his original 1762 opera by giving dance a more central role. Neumeier follows suit, relishing in gorgeous passages of music, and using dance to advance the story. Often portrayed as a musician, here Orphée (played by tenor Dmitri Korchak) is a choreographer and Eurydice (soprano Adriana Chuchman) is a ballerina, his muse. Anthony Freud, president and CEO of the Lyric Opera, calls the collaboration "unforgettable." Given its success, and the Joffrey's plan to make the Lyric Opera House its home theater in 2020, the venture may be a sign of things to come for two of Chicago's most cherished arts institutions. Adriana Chuchman, Dmitry Korchak and dancers of the Joffrey Ballet in "Orphée et Eurydice." Photo by Todd Rosenberg, courtesy Great Performances. "This is a statement about a really great collaboration between a major ballet company and a major opera company," says Wheater. "You don't see that very much in the rest of America. I hope that people take from it that the result is beautiful, and it was an inspiration for all of us who worked on it from the beginning." "Great Performances" airs Orphée et Eurydice on Friday, January 18 at 9:00 pm on PBS stations nationwide; check your local listings.